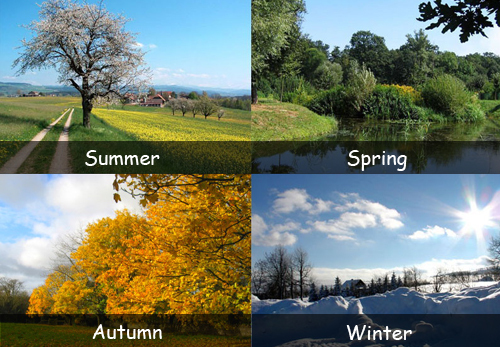 There are four types of seasons on earth: – spring, autumn, winter and summer. These seasons are characterized by differences in temperature and the length of daylight. Seasons are found only in the temperate zones. The equatorial regions do not have any noticeable seasonal changes. They have only two types of seasons, Wet season and Dry season. Polar Regions also have two seasons, a light season and a dark season. The spring season is a time of renewal. During this time, trees begin to develop (bud) and flowers start to bloom. Rainy days make it easy for plants, flowers and grass to grow. This season is also known as the fall. It brings colder temperatures and frost. Some crops are harvested during autumn. Corn is one of them. Animals prepare for hibernation during this season by eating a lot as they need to save the fat and energy for the harsh winter months. The winter season brings snow and ice to a lot of locations around the world. Most of the animals go in hibernation during this season, like bats, snakes, bears, skunks etc. Summer is a common season for thunderstorms. When the earth tilts towards the Sun, the more heat we get. Everybody loves the summer. Plants are in full bloom and the smell of freshly cut grass fills the air. What is the reason for the seasons? Our planet, earth takes one year to make a complete revolution around the Sun. It is the most commonly believed that the variation in distance between earth and the sun causes the seasons, but it is not true. The tilt of the Earth on its axis during the revolution is the main reason for the changes in seasons. The axis of the Earth is at a tilt of 23.5 degrees. During the Earth’s orbit around the Sun, there are times of the year when the North Pole is alternately tilted towards the Sun or tilted away from the Sun. June 21 is the longest day of the year and December 22 is the longest night of the year. Seasonal changes affect the plant kingdom. Declan, Tobin. " Types of Seasons Fun Facts for kids ." Easy Science for Kids, Apr 2019. Web. 25 Apr 2019. < https://easyscienceforkids.com/types-of-seasons/ >.